Lock in a great price for The Rilano Hotel München – rated 8.2 by recent guests! Cleanliness, comfotable beds, location (500 m from u6 underground train which will take you to the city center in 15 minutes, rewe grocery store, atm near by), free parking at the public street. Good location if you’re attending a concert at Zenith- less than €15 one way taxi ride. Almost all was good, the check in, the staff, the facilities, the location, and the value for money. The facilities are excellent. The staff are nice. Good room space. quiet location of the hotel with good connection to public transportation (Bus 50). Excellent restaurant for dinner... The staff are exceptionally friendly and helpful. The room was very clean and organized. The reception lady on 14july around 10:30was very friendly and gave us lots of information and help with her warm ,kind smile. The Rilano Hotel München This rating is a reflection of how the property compares to the industry standard when it comes to price, facilities and services available. It's based on a self-evaluation by the property. Use this rating to help choose your stay! One of our top picks in Munich.This 4-star hotel offers air-conditioned rooms with free WiFi, flat-screen TVs and hot drinks facilities. 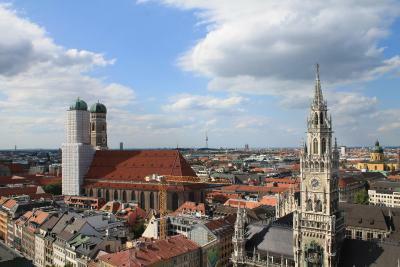 It lies in Munich's Schwabing district, a direct underground ride from Marienplatz Square and the Allianz Arena. 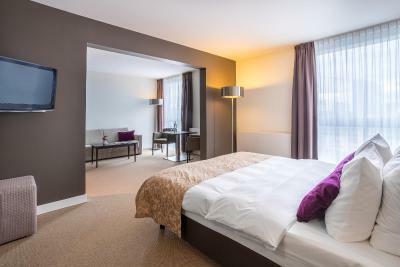 Rilano Hotel München has stylish rooms and suites with floor-to-ceiling windows. All rooms include a safe, mini-bar, electric kettle and bathroom with hairdryer and free toiletries. Interiors are decorated in soft gray and beige colors. The Rilano München is a 4-minute drive from the A9 motorway and a 20-minute drive from Munich Airport. 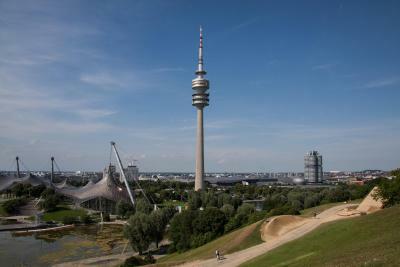 Within a 10-minute walk are the large English Garden park and the Alte Heide Underground Station. When would you like to stay at The Rilano Hotel München? Air-conditioned room with free mini-bar and a flat-screen TV. Also includes tea and coffee making facilities, a laptop safe and free WiFi. Free slippers and free toiletries are also provided. Offers extra space with a combined living and sleeping area. Air-conditioned room with a mini-bar and a flat-screen TV. Also includes tea and coffee making facilities, a laptop safe, free WiFi and free toiletries. Slippers can be provided upon request. Air-conditioned room with free mini-bar and a flat-screen TV. Also includes an electric kettle, a laptop safe, free WiFi and free toiletries. This room is suitable for 2 children up to the age of 14, sharing a sofa bed. The Rilano Hotels & Resorts flagship hotel is located on the northside of Munich, Close to the trendy Schwabing quarter: “The Rilano Hotel Munich” – a hotel for superb taste in the center of the Bavarian metropolis. Come enjoy our modern and elegant interior design, first-class Service and our fantastic Grill and Seafood Restaurant "Vitello"
House Rules The Rilano Hotel München takes special requests – add in the next step! Debit card The Rilano Hotel München accepts these cards and reserves the right to temporarily hold an amount prior to arrival. The Rilano Hotel München accepts these cards and reserves the right to temporarily hold an amount prior to arrival. Hotel room was not cleaned properly. Personnel did not respect my request not to disturb and entered the room anyway...when I was getting dressed. In room it was very hot and I could not have a proper sleep because of that. There was an air conditioning, however when turned on satisfying level was working loudly. For that price I would expect more. I won’t come back to that hotel for sure. Location was good, as I was looking for a place close to the office. However, there are just some nice things about that hotel. Clean hotel with comfy beds. Great access to public transport to get to the city. The rate I chose did not include breakfast so next time I would chose B&B instead of room only. Good sized rooms, nice restaurant and bar area and great location for our business meeting. The WiFi was temporarily unavailable in the rooms during my stay. Luckily I didn’t need it for work. Very nice room; great to have a fridge and kettle. Good sized desk and big wardrobe. Shower gel etc. provided. There is a handy mini-mall around the corner from the hotel. There is also a great coffee and bagel place on the ground floor - accessible from the lobby. Rooms were very quiet; no noise from traffic or neighbouring rooms. The room was a good size. 4 stars? Must be a mistake. I’d say 1. Almost. Too hot as winter settings in the rooms are over heated. Food trays left in the corridors smell. Breakfast is over priced (it may be Munich but the price is silly) it’s a business hotel. Not leisure. 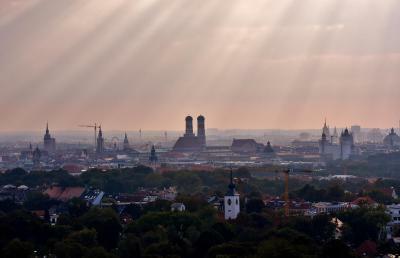 We were in Munich because of birthday of my wife, which we would like to celebrate in the city. In the hotel description WLAN was of course mentioned (which should be mandatory in a four star hotel). But during our stay (in the evening + night +in the morning) wireless was not working in all hotel facilities and we could not send any mail to our friends regarding evening plans. I was complaining many times about WLAN but the staff was helpless and technicians were not visible. We had the communicate by using German GSM-operator and had to pay expensive roaming fees to be together with our friends and in the morning we could not read our online news. Contrary to other hotels, the hotel was even not offering us a desktop PC to enable the communication with our friends on such an important day In addition, our safe in the suite was not working too. The worst the reception staff was unaware what to do in such cases. In the morning during our check out even nobody apologized for these inconveniences. WE WILL NEVER EVER STAY IN THIS HOTEL AGAIN !!! The in-room tea/coffee offering is limited. The hotel is modern and clean. Access to MUC airport is good, without having to make one’s way through city traffic. Breakfast price is really too high. Lovely hotel, very clean, friendly staff, and great bar and cocktails! actually the staff was absotuley great, except for one arrogant, cheeky and impolite check-in guy, who acted so inappropriately that it really killed my great impression of the rest of the staff, that was absolutely awesome and friendly.